Sp. Attacks Stench, "Bubble Shot"
An Artichoker is an artichoke-like monster that resembles an ordinary shrub. However, it has tiny legs instead of roots, allowing it to move. The plant creature also has a head (that resembles a fish) that remains hidden behind its protective leaves. Both the legs and the head are revealed when an Artichoker attacks. Artichokers can be found in Booster Pass, where most of the time they remain stationary, appearing to be normal shrubs. In battle, the Artichoker's leaves form a barrier that protect its head, giving the Artichoker high physical defense. Also, an Artichoker has two primary attacks when engaged in combat. The first is causing damage by scuttling around on its feet. An Artichoker can also shoot bubbles that cause damage on contact. 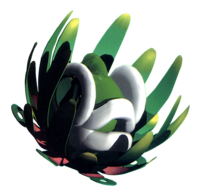 Additionally, the Artichoker can use the lightning attack Static E!, and spray chemicals to poison Mario and his party. If an Artichoker is hit with a special attack, it will use Recover to heal itself or other enemies on the battlefield. Artichokers are relatives of the Kriffids. Another plant-based monster, the Carroboscis, also resides in Booster Pass but is not related to the Artichoker. Sosokusa From 「そそくさ」 sosokusa (quickly) and 「草」 kusa (grass, herb). Artichoker's name comes from an artichoke flower, a perennial flower native to the Mediterranean region. This page was last edited on July 8, 2018, at 12:56.